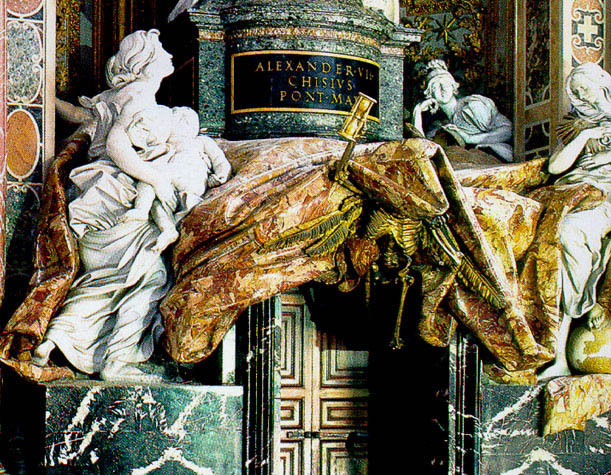 This monument to Alexander VIII uses a rich variety of precious marble. The bas-relief on the front which recieved high praise is of the Canonization of Five Saints, celebrated on Oct. 16, 1690. Leaving the main tribune and continuing our tour, immediately on the right is the Monument to Alexander VIII commissioned by his nephew Cardinal Pietro Ottoboni, to a design by Count Arrigo di San Martino, in 1725. 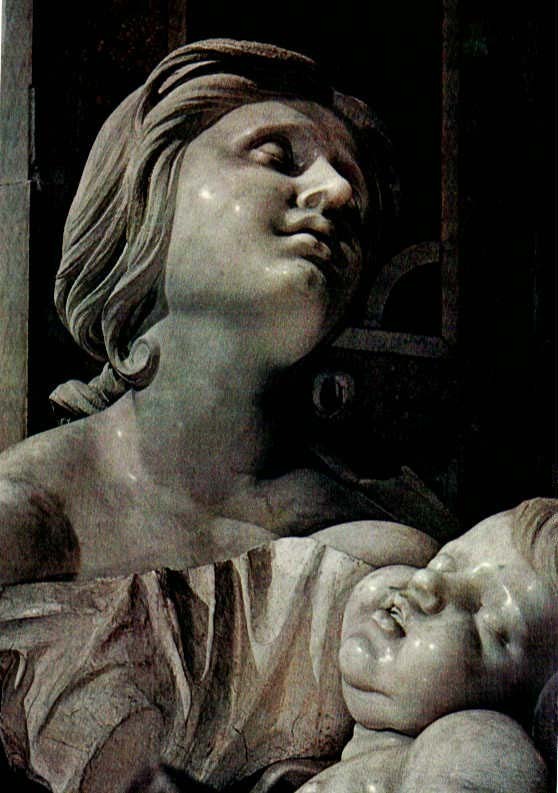 The monument, however, had been ready for some time, since De Rossi, author of the two statues of Prudence and Religion, had died in 1715. 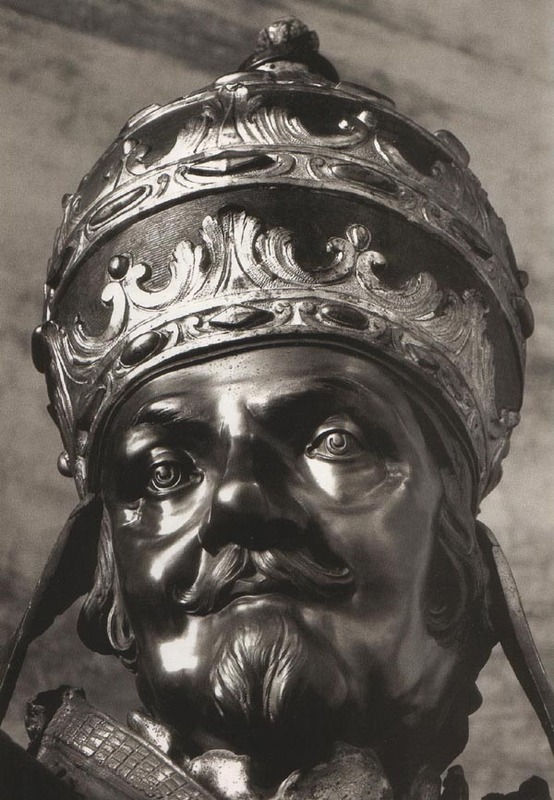 The bronze statue of the Pope is a fine work by Giuseppe Bertosi, who also made the front of the base, showing the presentation of the offerings to the Pope during the solemn canonization ceremony on Oct. 16, 1690. This monument, even though it shows little original inspiration, is remarkable for the rich variety of precious kinds of marble used. 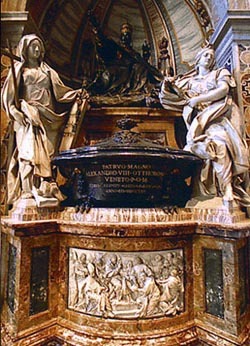 Even though the composition of the work, by Arrigo of San Martino, was influenced by Bernini, the monument is important for the interesting opposing colors between the bronze statue of the blessing Pope, admirably created by Giuseppe Bertosi, though lacking in originality, and the white marble of the other statues. The work particularly enhances the various colors of the marbles used, such as African, black lydite, fior di pesco, yellow and antique green, and the precious alabasters of Montauto and Palombara, set by gilded metals. 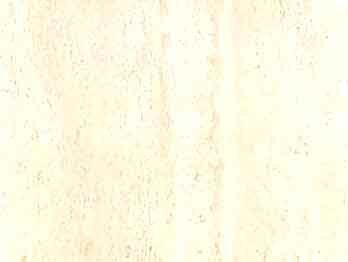 The bas-relief on the front of the base received such unanimously high praise that Louis XIV had a gypsum model placed in the French Academy as an example for the students. The work represents the "Canonization of Five Saints," celebrated on Oct. 16, 1690, with the presentation of gifts offered to the Pope. 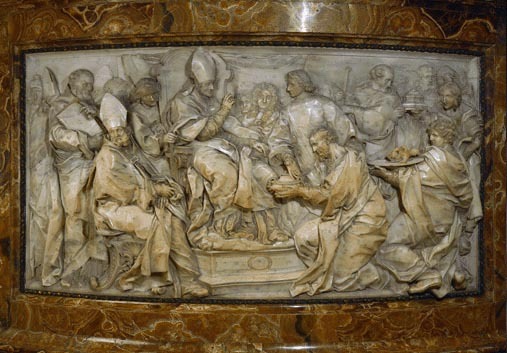 The Pope is seated on a throne in the center, in the act of blessing; three figures emerge from the sides, while others are behind and in the background; one of these is someone with a wig, which might be a self-portrait of De Rossi. The representation is dynamic and well supported by the various compositional lines and by the succession of expository planes. The five saints standing at the altars are Lorenzo Giustiniani, Patriarch of Venice; Giovanni of Capistrano, the Franciscan monk who distinguished himself in the victory of the Hungarians against the Turks; St. John of God, founder of the Hospital Order; St. Pasquale Baylon, the so-called Mad Saint and founder of the "Fatebenefratelli;" and Giovanni da San Facondo. 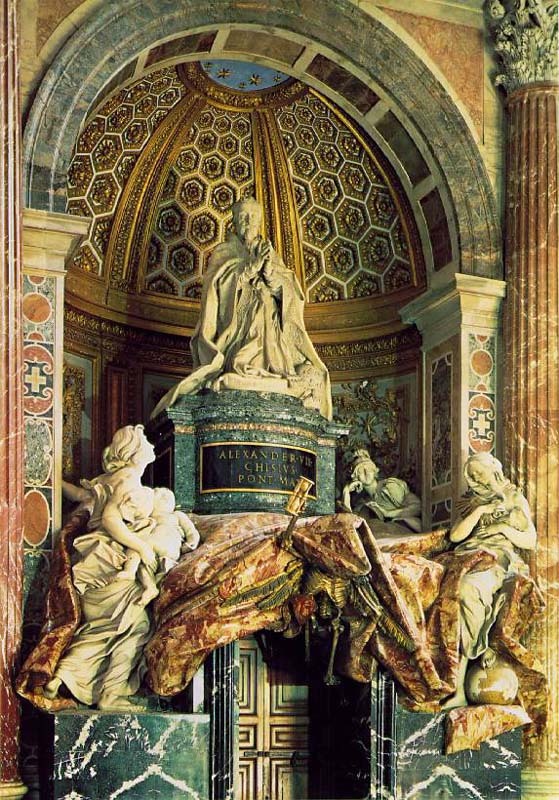 The beautiful altar-frontal, used on that solemn occasion in 1690, was donated to the Basilica by the Pope and is preserved in the Treasury of St. Peter's. In the aisle leading to the chapel of the Column stands the mediocre and pretentious monument of Alexander VIII Ottoboni (died in 1691), built from a design by Arrigo de San Martino; it is notable as the tomb which is richest in rare and precious marbles.